Dave Hill provides a funny anecdote of a discussion he had with his son about phones that required the involvement of an operator. He then discusses the fact that phone technology has advanced however business communication practices are not always taking full advantage of it. He provides an example of ineffective communication during the early stages of a project development. Workplaces can encounter tedious inefficiencies and even festering working relationships when using e-mail instead of picking up the phone or conducting face-to-face interactions. 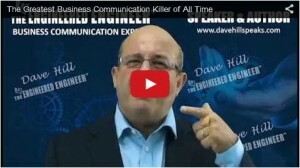 What are your business communication success strategies regarding e-mail v phone v face-to-face?